← Paraguay: Stuck on Stupid? In Brazil it has long been chique to emulate all things European. Unfortunately, this emulation has spread to growth rates, as well. 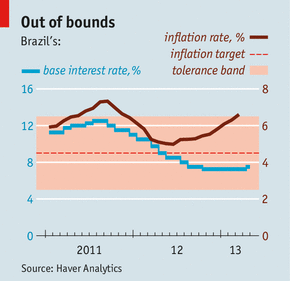 Last year Brazil expanded at the near-European rate of 0.9 percent. The IMF in its newest World Economic Outlook sees growth recovering to 3 percent for this year but then again my colleagues projected the same thing a year ago for 2012. Adding insult to injury, cutting historically high interest rates to record lows did not do much to get the economic motor churning again. Instead, inflation, Brazil’s economic malaise of decades past, is once again rearing its ugly head, forcing the Central Bank to re-raise interest rates. There are two competing responses to this question [the slowdown]. The first, favored by the government, places the blame mainly on external factors, such as the European crisis and the growth slowdown in China. The second emphasizes supply-side constraints, whether in poor infrastructure or tight labor markets. We attribute the growth deceleration primarily to a combination of the exhaustion of the consumer leverage cycle and the consequences of a loss of competitiveness caused by policies boosting labor costs. Since the loss of competitiveness has hit the industrial sector particularly hard, and industry is responsible for most investments, we judge there is a causal link between low competitiveness and low growth. I find his argument intriguing but ultimately not convincing. Apart from the fact that it appears just too convenient for an investment firm to blame “investor-unfriendly policies”, I see a number of weaknesses in his narrative. First and foremost, it looks to me like a Chicken-and-Egg problem: did the pronounced decline in capital inflows (the so-called “sudden stop”) cause the slowdown or did the slowdown cause the sudden stop? As with so many questions of causality, there might not be a definitive answer here. Yet the chronological order of events does not support Nomura’s argument. 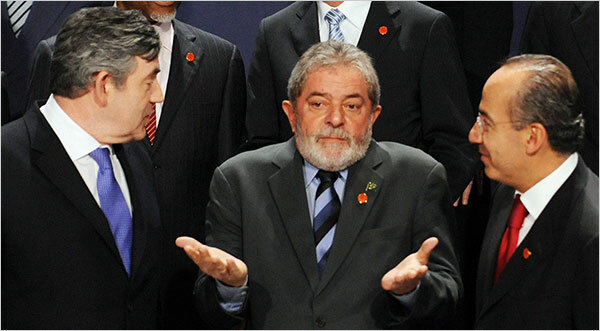 Brazilian growth peaked in the first quarter of 2010, capital inflows in the third (the “sudden stop” identified by Volpon didn’t happen until January of 2012). If professional investors are worth the money they are paid, surely by then they should have seen the slowdown coming (growth fell from 7.5 percent in 2010 to 2.7 percent in 2011) and moved their money elsewhere. To me this narrative – slowing growth leading portfolio investors to pull out – sounds more plausible than the idea that somehow loss of foreign investor confidence is depressing the economy. For the latter to occur, there needs to be a transition mechanisms between foreign investment and economic growth. The problem is that for the only plausible one (and the one Volpon describes), namely the cost of credit, the evidence does not support his claim here either. If the slowdown of investment flows had made credit more expensive, surely interest rates (not policy rates but the ones business actually pay) would have risen. The opposite happened. 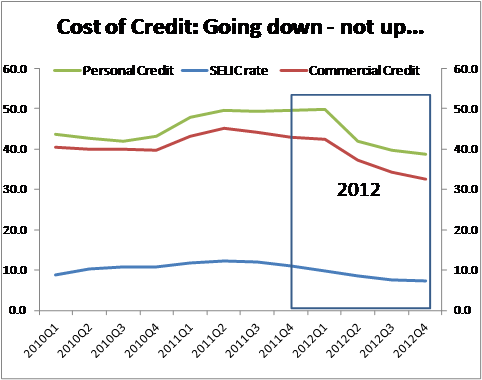 Interest rates paid by consumers as well as commercial borrowers actually fell by about 10 percentage points in 2012. There is simply no evidence for the decrease in bank liquidity Volpon is taking about. 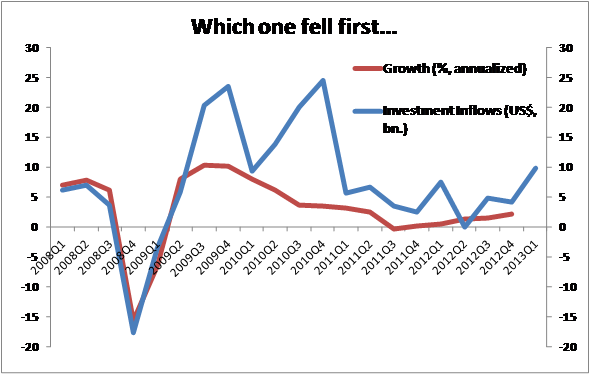 While it is true that a fall in investment (the real or fixed type which is measured in GDP – not the type Nomura engages in) was instrumental to the growth collapse last year, it is very unlikely that this was caused by a “sudden stop” in hot money flows or the government policies on such flows as Nomura would like to see it. So what is the problem in Brazil? To be honest I’m not really sure. My best guess would be on a combination of cyclical and structural factors. In addition to the supply constraints mentioned before, there is the downturn of a consumer credit cycle, some fiscal consolidation after stimulus in 2009 – 2010 and possibly the end of a decade long commodity super cycle which was an important driver of the Brazilian ascencion since roughly 2003. If expectations on commodity prices turn bearish, this will lead to reduced investment spending in all kinds of sectors stemming from offshore oil to steel and agriculture (the attentive Brazil watcher will remember that much of the investment during the good years was in commodities). Since I admit to not exactly knowing what’s ailing the Brazilian economy, it would be hard for me to predict if or when the current slump will be over. However I do want to caution anyone against drawing hasty political conclusions from it. One might be tempted to think that given sputtering economy, the opposition should fare better in the presidential elections coming up next year. But slow down. While growth has been disappointing other indicators are still strong: unemployment is at record low, consumption (which matters more to the typical voter) has kept growing at close to 4 percent and inflation, while creeping up, is about the same as it has been for years. As a matter of fact, as people have gotten used to more stable economic conditions they begin to focus more on other issues such as corruption, equality, discrimination or the role of religion in politics. Of course before the election in 2014 Brazil will host the Soccer World Cup. How the Seleção and the host country perform there may well be more influential than the current economic slump. Cornelius Fleischhaker is a Research Analyst at the International Monetary Fund. The opinions expressed in the post are those of the author only and should not be attributed to the International Monetary Fund. This entry was posted in Brazil and tagged Brazil, downturn, Economics, Inflation, Interest Rates, Investment, Investors, Nomura, why Brazilian economy is slow. Bookmark the permalink.